Name: Policy Set name can be changed at any time for all policies except for the Default Policy Set. Policies: Policies include all the policies that you can apply at the group level. You can also modify Policies at any time in a Policy Set. Groups: You can apply a policy set to one or more groups. Users in a group are assigned to the policies that are included in a policy set. Initially, only one Policy Set called the Default Policy Set is present. By default, the Default Policy Set is applicable to all users and groups. Each Policy Set has a unique priority from 1-n with 1 representing the highest Priority Set. You can modify Policy Set priorities at any time. The Default Policy Set has the lowest priority. You cannot modify its priority. Policy Set priorities are maintained to resolve conflicts when users who are members of multiple groups have different Policy Sets assigned to them. 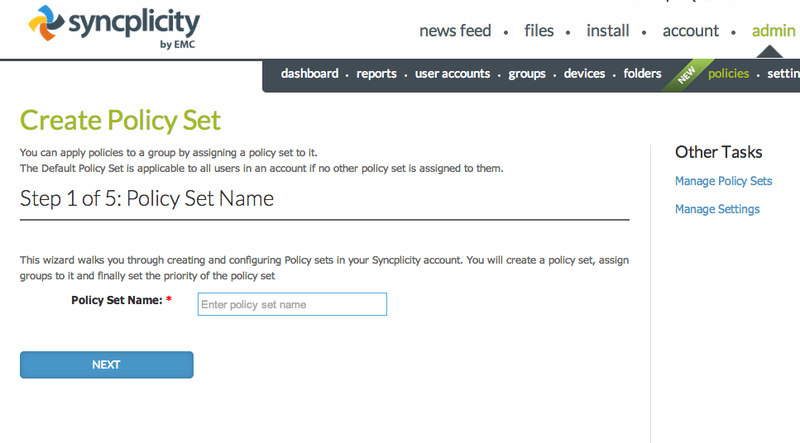 When an administrator logs into the Syncplicity account for the first time, they can only view the Default Policy Set. 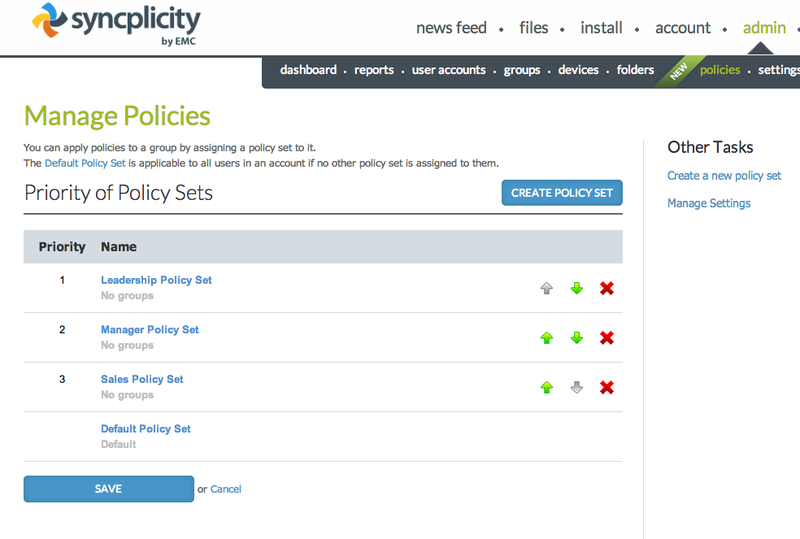 Default Policy Set policies are applicable to all users and groups by default. You cannot modify the name and priority of a Default Policy Set. The following figure shows a first-time experience with a popup that provides a brief description about Group Policies. Clicking on Learn More brings you to support articles on Policies. As soon as you close the popup, the following page appears with only one Policy Set, the Default Policy Set. The policies in this set are initially applicable company wide to all users and groups. 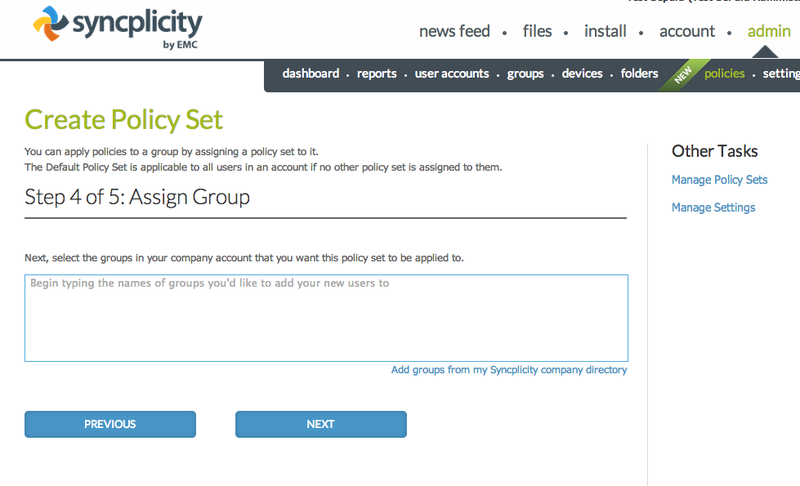 You can create one or more custom policy sets and assign it to one or more groups. 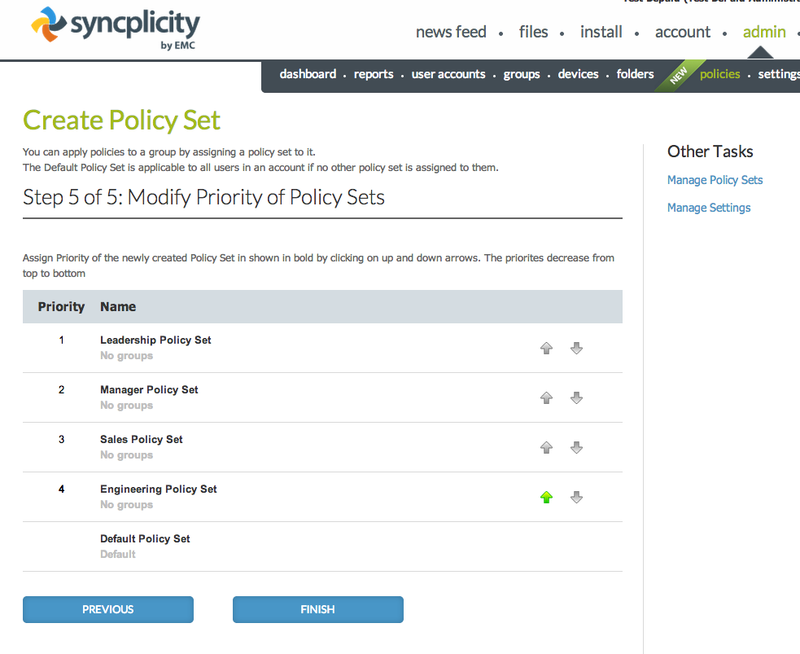 When you have more policy sets than just the default policy set, the Manage Policies page shows all of the policy sets currently configured. You can click the up/down arrow to modify Policy Set priorities. You can click X to delete a Policy Set. Changes to Policy Set Priorities and Deletion do not take effect until you click SAVE. You must be careful when you delete or modify priorities of Policy Sets because it can affect large number of users. For example below you can see four policy sets with Leadership Policy Set being of the highest priority. 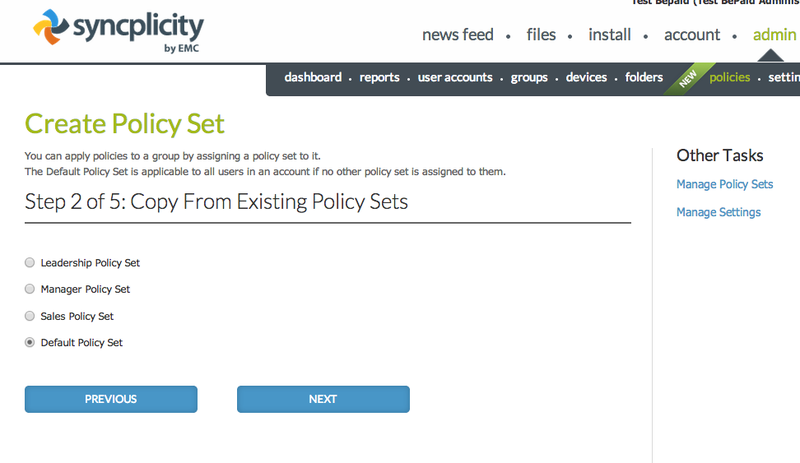 If you click on any of the Policy Sets above, the Manage Policy Set page below for the selected Policy Set appears. You can modify the name, policies, or groups for a Policy Set on this page. 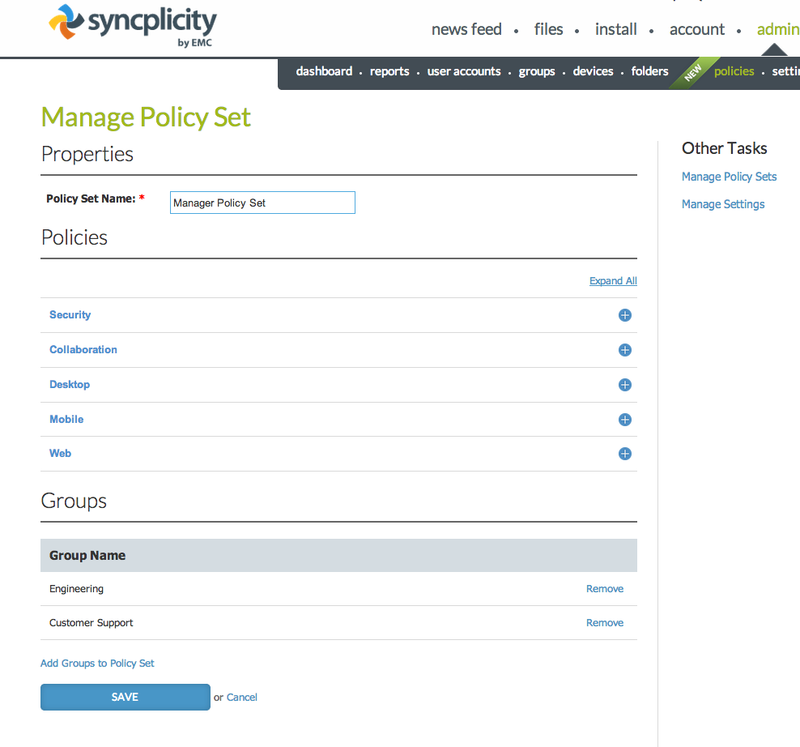 For example, if you click Manager Policy Set, the Manage Policy Set page for "Manager Policy Set" appears. 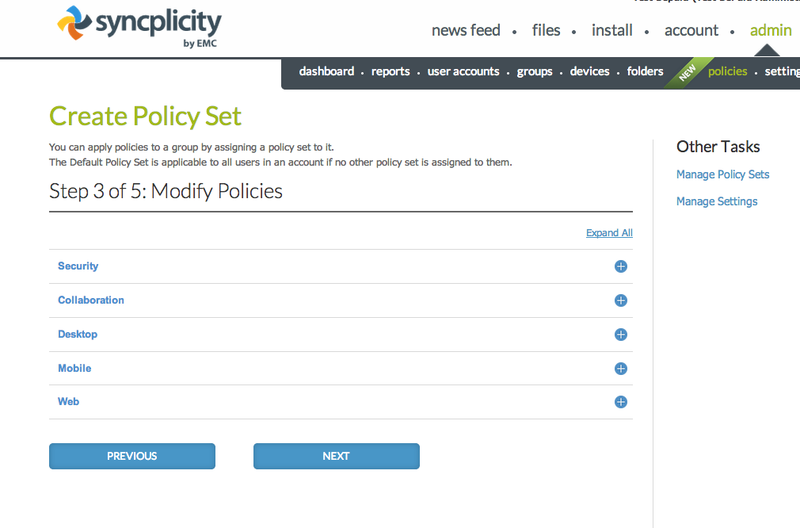 You can modify the Security, Collaboration, Desktop, Web, or Mobile policies for this policy set. Clicking the '+' icons displays the policies under each section. The policy set shown below is currently assigned to Engineering and Customer Support groups. However, you can remove the groups at any time. In addition, you can add new groups. The changes to the policies or groups do not take effect until you click SAVE. From the policies page in the admin console in the Manage Policies page, click the CREATE POLICY SET button to display the Policy Set creation flow. Type the name of the Policy Set. Policy Set names must be unique. Copy the Policy Set from any of the existing Policy Sets. All the policies in the new Policy Set are copied from the one that you selected. By default, the Default Policy Set is automatically selected. However, you can select another Policy Set from which to copy. Modify the policies in the policy set by expanding any of policies section. Assign one or more groups to the Policy Set. 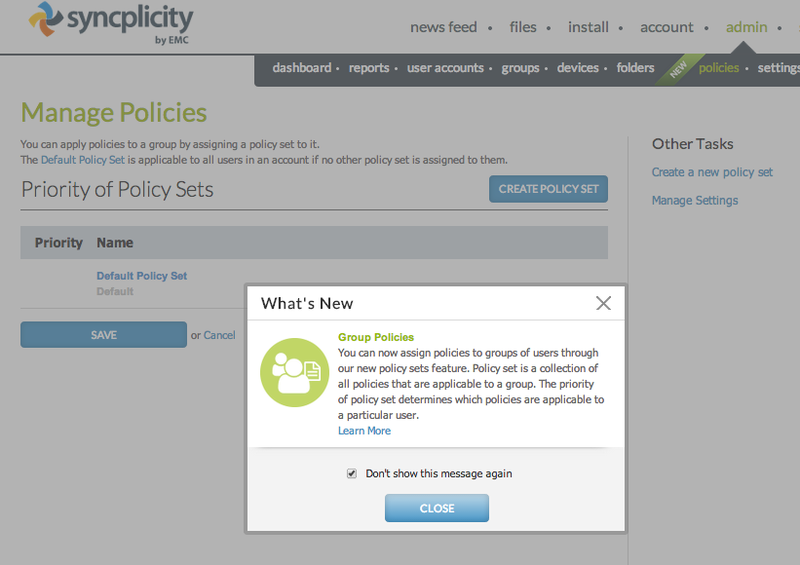 You may not want to add any groups now but add them later from the Manage Policy Set page as shown previously. The new policy set will be listed on the bottom right above the Default Policy Set. Assign the correct priority to the new Policy Set. You can only modify the priority of the new set. For example, you can create the Engineering Policy Set in the following page. You can also click on the up/down arrow next to it to assign the correct priority. Assign Policy sets to a Group: Administrators can quickly assign a Policy Set to a new group during its creation or to an existing group by going to the Manage Group page and changing the Policy Set. Learn more about Groups. Determining a Policy Set for a User: Administrators can quickly view the Effective Policy Set that is assigned to an user by going to the Manage User page for that user. When a user is a member of multiple groups and has different policy sets assigned through different groups, only one is applicable, which is the one with the highest priority. The applicable policy set appears on the Manage User page as a link. When you click the link, any policies that are applicable to that user then appear. Reporting: All the actions for creating, modifying, and deleting a Policy Set are recorded under administrative actions. Administrators can then run action reports to quickly obtain this information. Please refer to the operations reporting -> Audit Administrator Actions for information about this report.